For this project, our client had several conference rooms throughout their office space that did not have have exterior windows; resulting in zero natural light. They wanted to add frameless glass doors and sidelights for their openings, but standard glass doors would leave the room completely exposed. 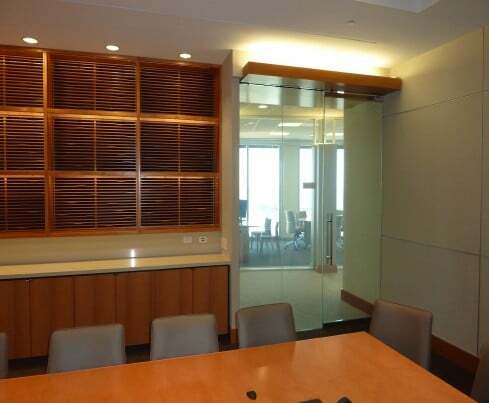 Typical problem with glass walls in an office, but eGlass was the perfect dynamic glazing solution. Switchable LC Privacy Glass allowed for the client to have everything they wanted with no sacrifices. All openings were replaced with eGlass frameless doors & sidelights. When eGlass doors are powered, there is clear view into the rooms. 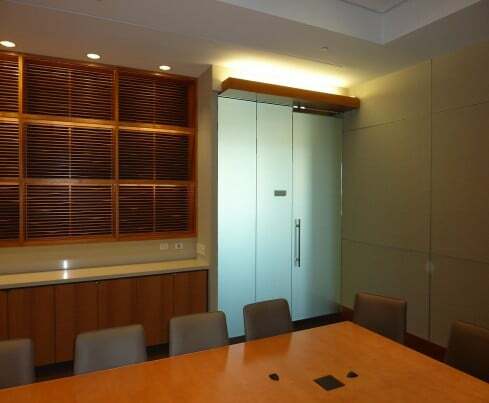 When a meeting is in session, LC Privacy Glass is powered off, allowing glass to revert to a fogged frosted white state & blocking vision; all while still allowing light to enter the room. Natural light flowing through the office space, elevated the atmosphere by keeping rooms lighter and brighter and helped reduce the need for overhead, artificial lighting. Our Frameless eGlass doors feature sturdy, through-bolt mounted hardware & handles, requiring minimal effort for installation.